❝ He exaggerated the trade deficit with other countries. The figures that Mr. Trump listed account only for the United States’ trade in goods and do not include trade in services. In 2016, the United States’ trade balance amounted to a $309 billion deficit with China (not $350 billion); a $63 billion deficit with Mexico (not $71 billion); and a $7.7 billion trade surplus with Canada (not a deficit of $17 billion). In Mr. Trump’s telling, Prime Minister Justin Trudeau of Canada disputed the president’s estimate of a $17 billion deficit when they discussed the issue behind closed doors, but he excluded oil and lumber to claim a balance. The trade balance data does, in fact, include oil and lumber. And this was Trump taking it easy on the lying for the holidays. 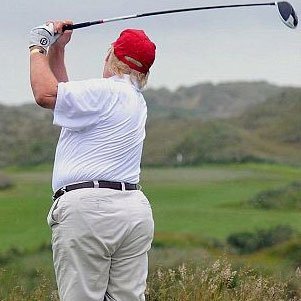 Staying in shape for lying about how well he plays golf.